Trevor and I made the commitment to each other at the beginning of the summer to spend more time at the family cabin. Now that summer is quickly drawing to a close, I am happy to report that we made good on that promise. 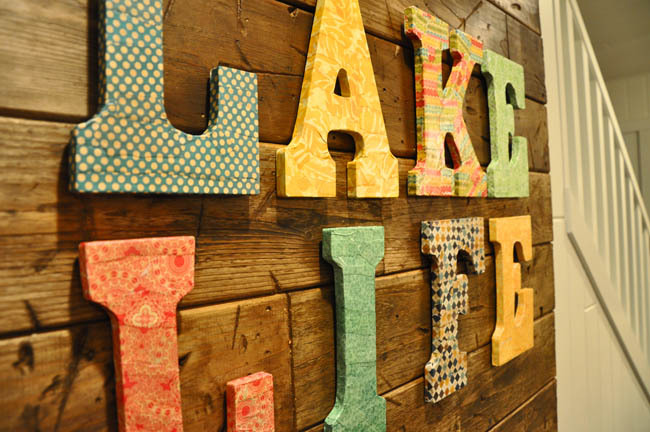 As we drove away on the very first Sunday night in mid-May, we looked at each other and both agreed, “we love our lake life.” It’s simple, without laundry or work or runs to Target at 10 p.m. I wanted to figure out a way to memorialize that feeling. I got some inspiration after seeing these cute letters at Anthropologie. 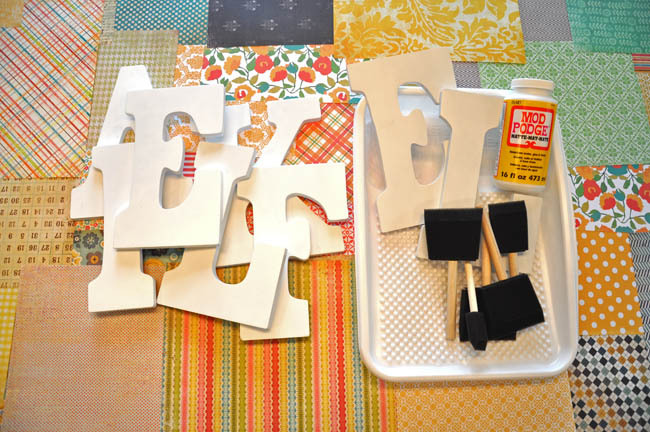 Taking the DIY approach, I purchased these wood ones at Michael’s, along with a variety of craft papers to attach to the letters with Mod Podge. I don’t have any words of wisdom for this process, other than to be confident it will turn out well, no matter how much you doubt it during the application of the soggy paper. I do recommend having a wet rag handy, so that you can wipe your fingers often – it’s a messy and sticky endeavor! I applied the Mod Podge to the surface of the letter, as well as to both sides of the paper, which I tore into strips to be able to turn the tiny corners of some of the letters. 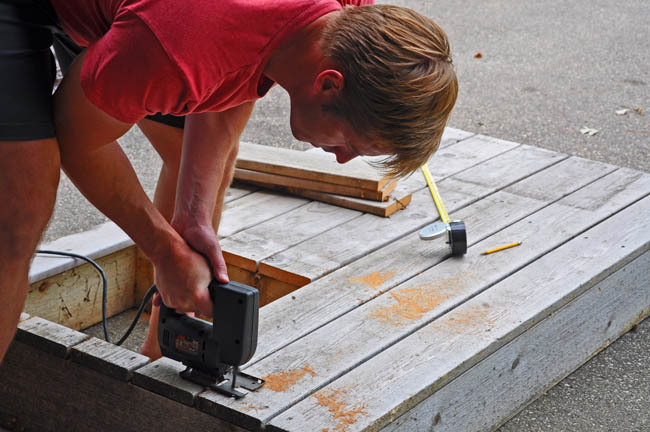 For the background of “Lake Life,” we broke up what was previously used as a front stoop to the cabin. 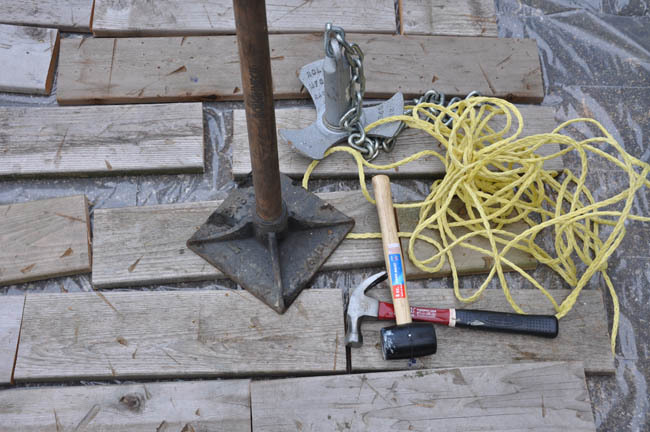 We sawed the wood in random sections, distressed it (i.e., took a whack at it with the usual culprits – a hammer and a chain – and threw in a lake item (anchor) for good measure), applied diluted stain, and reattached the wood to some pieces on the back. 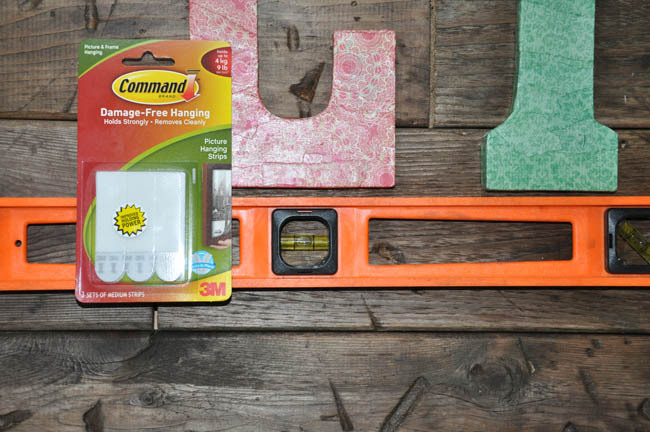 Although the letters have slots on the back from which to hang, hanging each letter level with the next using that method seemed like a dauting task. So, I opted for the 3M hanging strips. I love how they attached the letters firmly, but gave me some wiggle room to move the letters if needed. Reality Check. I must say, I really liked the process of deconstructing the stoop and distressing the wood for the “frame” (perhaps because we generally are terribly un-handy and this made Trevor and me feel pretty accomplished), but If I had to do this again, I would totally just buy the Anthropologie letters. The Mod Podge process took a LONG time. 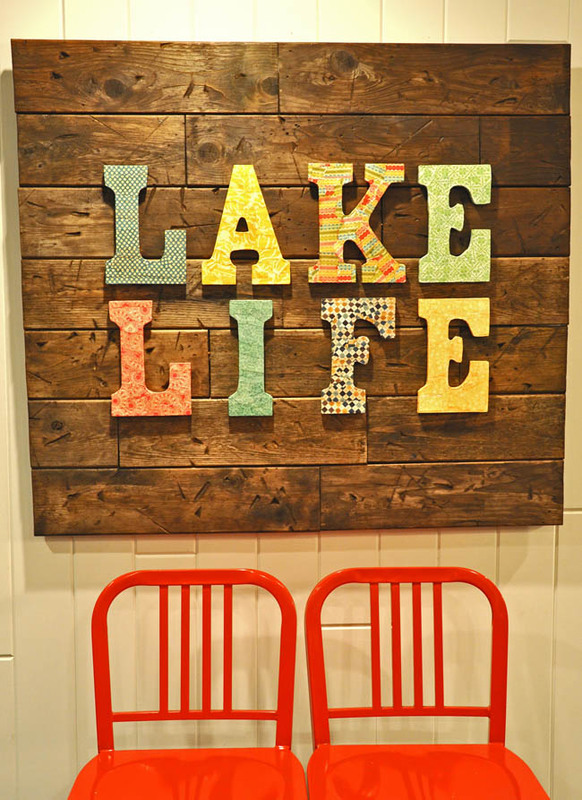 Had we not had a couple of rainy days in a row, and had I not been able to send the “K” and the “F” home with my mom to finish (those two seemed like they may push me over the edge), there is a very good chance “Lake Life” would never have been completed. I like the “wander away” terminology. It makes it sound as though it just became not very interesting – as opposed to “hair-pulling frustrating, leading me to quit” (which is often how I feel with big projects). Kerry (& Trev)! This is super fantastic. I loved reading every second of this post. Now I have to read the rest so I know what else is going on in your magical lives. Sounds like the appropriate letters were most difficult. “F” and “K” pretty much spell it out for you! Rox! How sweet are you for commenting!? And how fun to hear from you, not to mention a huge compliment, what with your lovely artistic talent! Just the other day I found that little landscape piece you did for me in college. Love.